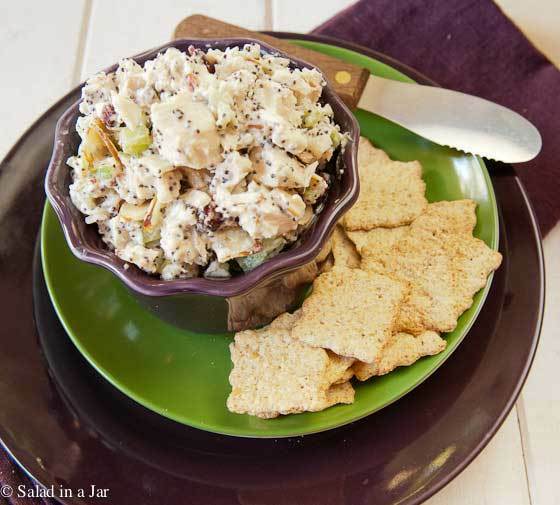 Poppy Seed Chicken Salad is a fancy chicken salad laced with poppy seeds and cranberries. It’s suitable for a weekend brunch, ladies luncheon, or a game-day party. How many recipes for chicken salad do you have? Every cook has a way of adapting recipes to their own tastes just like we all have a certain way we like to wear our jeans. A basic pair or recipe is timeless. Although I only have one chicken salad recipe in my index, I have several. One is an everyday mix-in-two-minutes-spread-on-white-bread recipe. Another is a curried chicken affair. (I make it when I don’t want my husband to eat it.) The third is this Poppy Seed Chicken Salad recipe. I found the original recipe buried in a notebook of company recipes for a pizza chain. I used to work for Pizza Inn in research and development. First, I set about revising the amounts to make them domestically appropriate. Then, I dressed it up a bit when things like toasted almonds. Finally, I lightened it up a bit with yogurt and a touch of lemon juice. 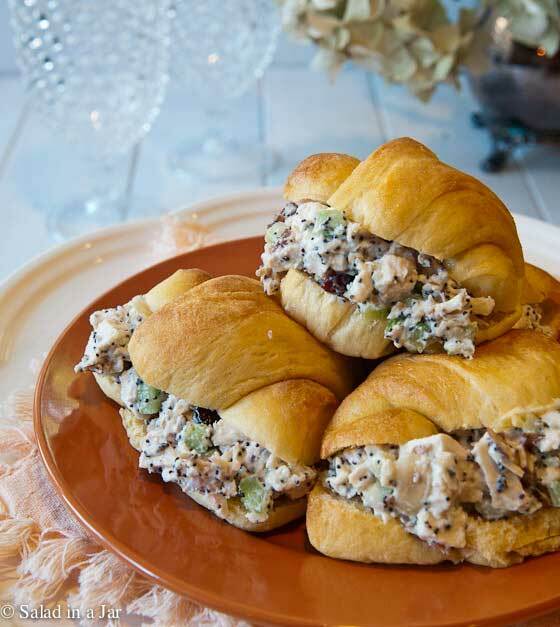 I love this chicken salad served with homemade rolls of almost any kind. My current favorites are these sweet potato rolls made into crescent or “butterhorn” (as my mom used to call them) shapes. Other possibilities include crescent rolls out of a can or croissants. Another idea for chicken salad is to make sweet potato chips and eat them with a spoonful of chicken salad on top. Low-carb never tasted so good. What I do most often is spoon it on top of a huge salad (vacuum-packed). Add a little olive oil and vinegar. Sprinkle with fresh Parmesan cheese. Eating this for lunch is guaranteed to improve the rest of the afternoon. Stir all ingredients together in a bowl until combined. Replace the almonds with pecans. Absolutely divine! Substitute sour cream or more mayonnaise for the yogurt. Vinegar is a good replacement for lemon juice. I made this for dinner tonight and it was a huge hit! It is so easy to put together, yet tastes special because of the almonds and cranberries. I used shredded chicken (canned) which really cut down on the prep time. This is definitely going into my recipe file. Thank you, Paula. Paula, I made this chicken salad for my son’s 9th birthday party. He wanted a cricket themed party (the sport-my husband is South African) so I wanted something a little elegant for the adults. We had beautiful weather and I made & assembled the sandwiches on homemade buns (yes! I used my bread machine! I used a sour cream dough, however.) with a piece of romaine lettuce and a toothpick through the center to keep it all together. I received many, many compliments! Thank you for sharing your fabulous recipe & helping to make my son’s party special! Made this salad and loved it! I am adding it to my list of fav Chicken Salads. Thanks for sharing! A dear friend sent a link to me, which led me to your youtube.com salad-in-a-jar video, and I’m so glad that she sent it! After viewing that video, I just had to do a search in order to find your blog, Paula. Who could resist? Well, you grabbed my attention right away with your yummy sounding chicken salad recipe. I know what I’ll be putting together tomorrow! I’m off to my kitchen just now to prepare dinner, but I’ll be right back to take a better peek at your site. You made me laugh Piper. So just what was your plan for the CHIA seeds? That’s a territory I have yet to explore. This sandwich looks gorgeous. I can only imagine how it would taste on brioche. I’m going to give it a try. Which of your bread recipes is the best to use with chicken-salad sandwiches? That question is like asking who is my favorite child!! Current favorite would be the sweet potato rolls followed by My favorite dinner rolls or brioche. If you want regular bread– the Sweet Milk White Bread would be fabulous. Oh, yum. I don’t use poppyseeds nearly enough. I always like chicken salad and this one looks yummy. I did make your sweet potato dinner rolls and we all enjoyed them for our Christmas dinner. I guess you and I were eating the same kind of dinner rolls at our Christmas dinner. Hope your new year is going well. Ok never mind. I didn’t see the entire post on iPad mini until after clicking submit. You already answered my question. Already made this & packed in lunch for work! Yum! And so easy to throw together! What type of bread/crackers do you recommend to go with this for maximum satisfaction of my taste buds? I forgot to tell you that Special K Crackers in the Multi-Grain variety are really good with this salad. Actually. They’re just really good. Period. Similar to wheat thins. That’s what you see in the top picture of this post. Hi Paula, love your chicken salad, it sounds wonderful. I think poppy seeds make everything a bit more special. I have a favorite chicken salad recipe, too, but I’m always on the lookout for new ideas. Love this one! This sounds like a wonderful recipe and those sandwiches look so appetizing! This is a great salad, delicious! Was fortunate to receive some and I would definitely make it myself. The yogurt gives it a different texture/taste. Thanks Paula!